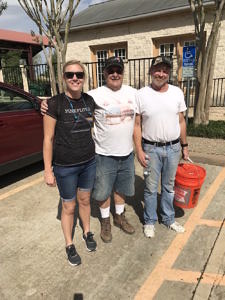 Welcome to the Houston Community ToolBank blog! 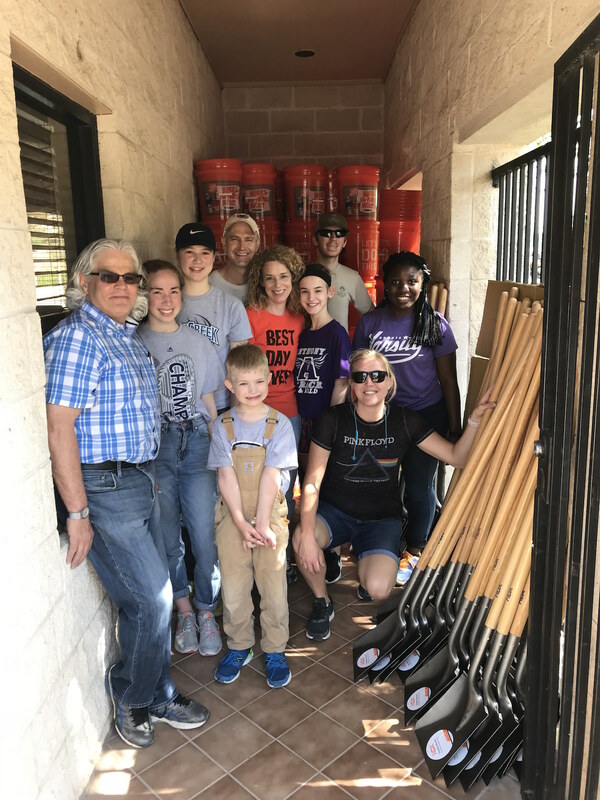 This is the place to see where our blue tools are, what’s happening in the warehouse and the office… and which project is next up for the ToolBank. For our first blog post, we’re excited to chat a bit about our Tool Shed Replacement Program. 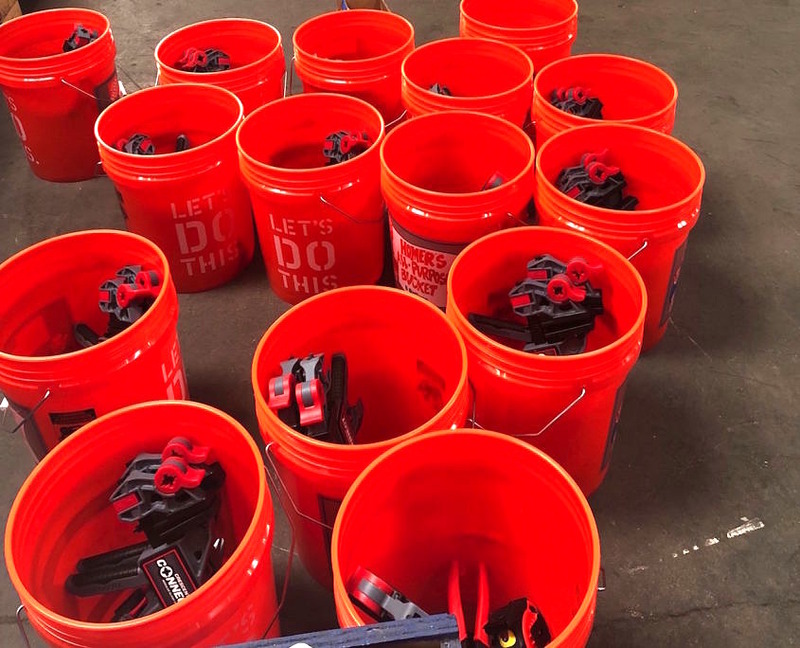 As of last week, we have sent out 450 tool shed replacement kits into the community to be given to individuals impacted by Hurricane Harvey. The kits were put together using tools generously donated by Apex, a tool manufacturer based out of Maryland. Some of the assembled Tool Shed Replacement Buckets in the Warehouse. Since Hurricane Harvey hit Houston, we’ve been working with nonprofits all across the region to help with recovery, lending out tools to organizations working on projects of all sizes. All tools lent out for Harvey-related projects are free, which means the nonprofits, churches, schools and community organizations that borrow are able to focus their funds and energy on important recovery efforts. Our blue tools have equipped more than 30,000 volunteers to complete over 90,000 hours of relief and recovery work since the storm. The concept for the Tool Shed kits arose from the generosity of an in kind donor, Apex Tool Group. Apex donated 64 pallets of tools to us for recovery efforts, valued at an estimated $200,000. 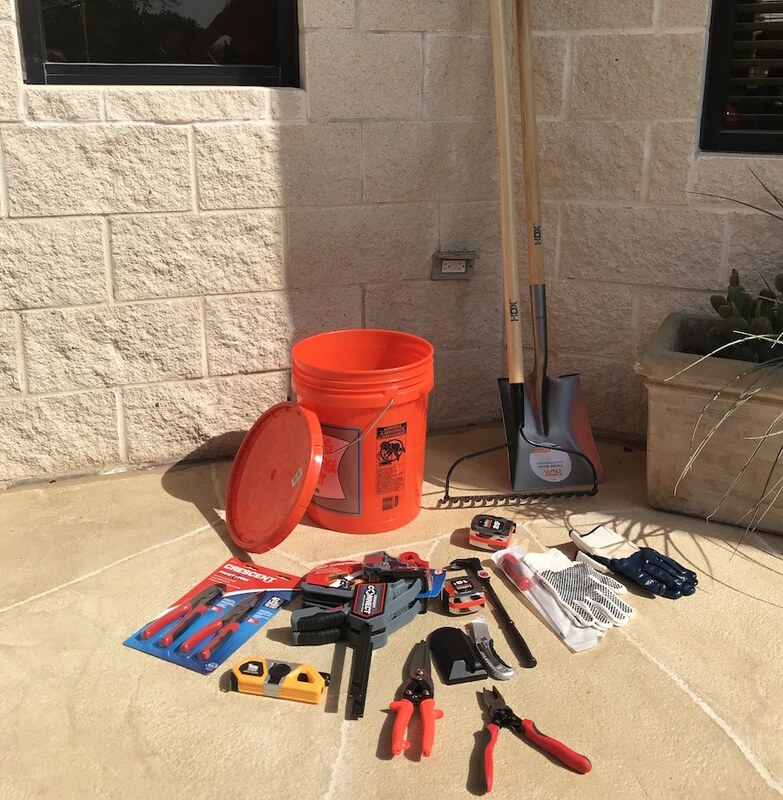 While many donated Apex tools have been incorporated into our inventory and lent out, there were more items given than could be used by our members for recovery efforts. Erika Hornsey, our phenomenal Executive Director, designed the Tool Shed Replacement Program to ensure that the tools were part of Harvey recovery as the donors intended. 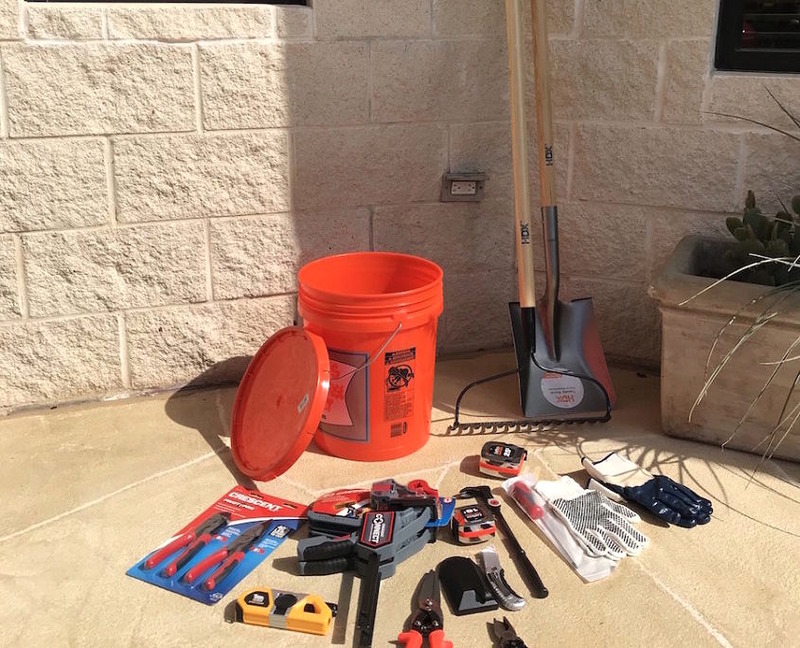 Each Tool Shed kit includes a brand new shovel, a rake, pliers, gloves, and measuring tape among other items. A complete Shed Replacement Kit laid out. Putting together 450 kits may seem too large a project for our small staff, and it certainly would’ve been without volunteers. Without Gates Millenium scholar volunteers, the kits would have taken a huge amount of time to assemble. Many of the tools were taken out of packaging and sorted by numerous other groups, as well as our tireless warehouse assistant Kelsey Smegner. We’re so grateful to the volunteers and staff who make it possible to undertake big projects like this one. Since we work mostly behind the scenes with our member organizations and groups, distribution of the kits to individuals was done through a few partner organizations and corporations who are working on recovery efforts. The three chosen organizations are Harvey Housing Recovery Project, Habitat for Humanity and UPS. 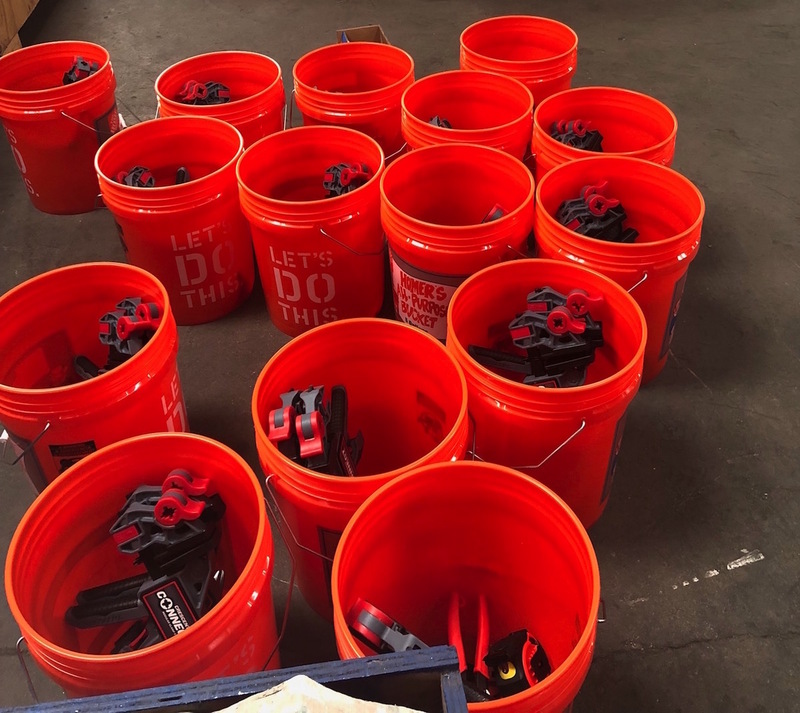 The last large group of buckets went out just last week with UPS, who will distribute their kits to UPS employees who were impacted by the storm. Habitat for Humanity will be giving one kit to each Harvey-impacted homeowner they work with. Harvey Housing Recovery has already distributed their kits to the hard hit Canyon Gate community, in which all 723 homes were flooded. The kits came at a time when the community certainly needed a boost. Harvey Housing Recovery group of volunteers and bucket recipients. Anna, one of the residents who received a kit, explained how much the kits helped her as she continues with DIY repair projects around her home. At a time when financial resources are stretched thin, the tool kit helped tremendously. In late April, we shared a post about our kits on Facebook, and a number of local groups took note. For instance, we were able to work with Memorial Moms, a group of women who have done a huge amount to help their neighbors on the west side of Houston. 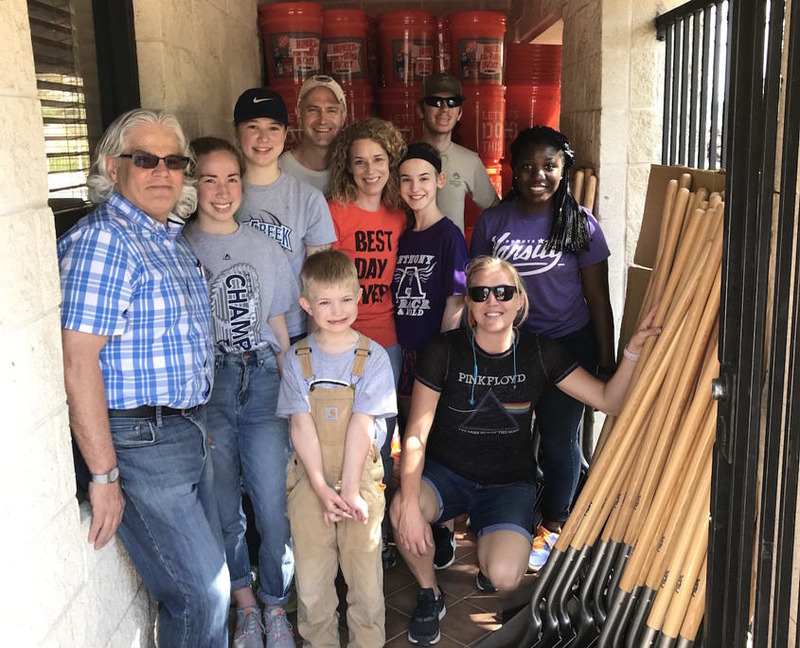 They were able to distribute hundreds of items to their neighbors as part of welcome kits given out to home owners returning to their houses for the first time. While we don’t have assemble kits left, we do have many items still available for donation, so please let us know if you know of an organization that could help us with distribution! A big thank you to all involved with the kits – from Apex to Habitat for Humanity Houston, Harvey Housing Recovery Project, UPS and Memorial Moms. We couldn’t have done it without you! 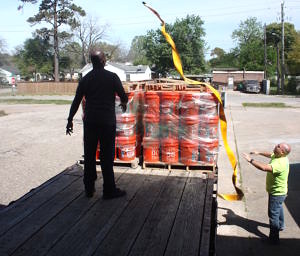 Loading some of the buckets onto the Habitat for Humanity flatbed.